Place of Missing Sumerpur, Hamirpur, U.P. He went to Saraswatty Vidya Mandir Hamir. He did not return home. 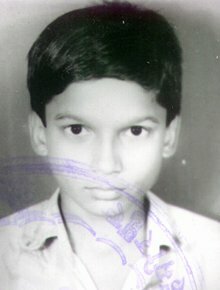 He went missing from Bus stand Bharua, Sumerpur, Dist. Hamirpur, UP. He was last seen wearing white shirt with black stripes, khaki colour pants and black Hawaii Chappals. Other Information Can speak, read and write in English & Hindi. He does not wear contact lenses or glasses.